Keep in mind that Burmese jade is jadeite and what is usually defined as Chinese jade is nephrite which is more or less the same but a bit less hard and with not as attractive colors and textures. This are the small little things which makes Chinese women happy in an advanced state of dating. Jade gemstones that is what people commonly define as jade is known for about 6000 years, jadeite not. In prehistoric ages, people used it for weapons, tools, and jewelry among other. In about 3000 B.C. jade was already known as the royal gem with similar value as gold. The cultures in the Americas such as Mayas, Aztecs, Olmecs and other also valued it higher than gold, in ancient Egypt, it was highly appreciated. In recent times the major mines which have been in Turkestan and not in China got exhausted so the Chinese started to buy jadeite jade in northern Myanmar and this business grows rapidly but the costs for the green stone from Kachin State had a substantially higher quality in texture and color so they used this superior jade stone here is the raw jadeite jade version. In the last century there came change after larger sources of nephrite were found in Canada (BC), Australia, New Zealand, and some other places worldwide. Now the market is practically divided into jadeite and nephrite but most people don’t know which can bring quite some money to the sellers who sell cheap nephrite on high jadeite price. Unfortunately, since the Chinese got somehow unchained from their "red madness" and turned consumer oriented the demand virtually exploded and many people in Myanmar (Burma) made a lot of money. branches of the Kachin Army at bay. usually, various Kachin groups don’t like that because this is their state and so they fight against the Chinese and Myanmar Army. Where to buy this pretty thing? One of the most exciting jade bazaars is in Yangon (Rangoon) Myanmar. The product range is available in the Bogyoke market which means jewelry such as are pendants and bangles, followed by necklaces, earrings, rings and some rather strange oval pieces with very good carvings which people just hold in the hand and put frequent pressure on it. There are two main places in ASEAN which are known for jade/jadeite/nephrite. This is Kachin State in Myanmar where all colors are available and Aceh Province in Indonesia where they are rather known for very green and black shades they produce nephrite. Around hundred jewelry shops are located in the Bogyoke Market, that's the premier place for Yangon gemstone shopping. There is also a well-known jadeite jade market in Mandalay because the second largest city in Myanmar is next to the mines. Used for various purposes since around six thousand years jade became widely available for everyone as the base for attractive jewelry only in the last few decades when many deposits of nephrite were discovered in Canada Australia and other countries. But it needs to see the difference between jadeite and nephrite jade the latter is also known as "Chinese Jade" but the first is mostly used to create high-end jewelry since colors and texture are better. The magic transparent look can both make virtually shine. Most people associate the stone with green color, the fact is the whole rainbow range is available although not everywhere where it is found. E.g. blue jadeite is available in Central America but in Myanmar (Burma) which has the largest deposits of this precious stone that color is not found but all other. They use Lapis Lazuli instead when blue is requested. Both versions are mainly used to make jewelry such as bangles pendants bracelets necklaces earrings plus other to make pretty women even more attractive. people jadeite jade jewelry is special. Since it is the best it's also the most expensive, we talk about green jade with a particular color, intensity, and texture. But not only the green color makes the price, there is also translucency, texture and the consistency which means are there cracks and inclusions or a uniform color. Some people manipulate cracks by injecting resin under high pressure and bleach the item in acid to make it lighter. The mineral has dual use, one is precious jewelry and the others are art objects in the high-end price range. That needs top artistic skills because of the fragility of the subject, e.g. , making leaves and similar works. Jadeite as a precious stone always attracted attention and the deep green version is the most precious. For a jewelry and object collector of jadeite, there are many aspects such as texture, color and composition, the quality of carving, and the symbolism inherent. Imperial Jade Rings have dual use one is precious jewelry and the others are art objects of the high end. Why women and men's Ring? Usually, jewelry is a women domain although men gain some market share. But with black jade rings, it is the opposite they are more often seen on a men's body. There are two distinctive ring style, old fashion, and new ideas. The conservative style is based on a piece of jade cabochon on top of the silver or white gold setting preferably green or white translucent. A jade ring is the smallest possible version to satisfy the common superstition that the mineral is protecting against evil and has some positive influence on kidneys malfunction (when ground). When buying any jadeite have a long look around the jade because there can be steep differences in prices which have many reasons, e.g. is it "utility jade" or top grade AA? Often with such little things visually there is no difference but the money spent can be in the another region. Also, the style is important and is carved out of a solid block of jade or just sitting on top of a metal frame? In recent years one particular styling came up which is called "Korean Style" having made out of a solid piece. Also, bands are popular, often made from very thin imperial jadeite with a gold frame which is a great design idea. 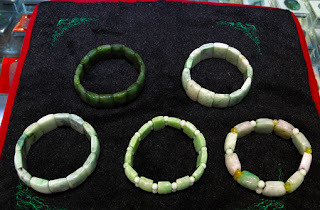 Mostly jadeite jade and some nephrite jewelry for sale in this exotic bazaar come from workshops in Mandalay where they manufacture rough stones into jewelry and other items. Typical are Buddha statues, pendants, ball chains and other necklaces. There are all variants of artwork made from; most popular is from green and white color. There are very pretty decorative ornaments in many varieties, colors and as carved items in a wide price range which span from around $ 8,- for a genuine (no joke). It's available at the Bogyoke Market in Yangon and Mae Sot, Thailand from a few dollars to several thousand, it depends on the texture, color, and translucency. Highest prices are paid for imperial jade with deep green and jewelry without impurities. Beside of rings and necklaces, bangles are one of the most popular used jewelry items they adorn many women with the younger crowd pendants are more popular both are for sale with different colors and designs. A bangle made of emerald green color means good fortune to the woman or child who wears it and since Chinese are imbued with superstition and superb works it's always a good reason to buy jade jewelry. Art carvings are admired for the great colors and sensuous feeling which comes over via a marvelous aura. Most new collectible and jewelry such as rings, bangles, bracelets, earrings and other are made from imperial and other jade is one of the most-loved collectibles since people still value the ancient roots and the medicinal and protective properties. Although the trend to buy the stone went from nephrite to the imperial or fine green version in the last decade no much difference in general happens. Chinese women still decorated their hair and other body parts with jade jewelry and who is real wealthy add some diamonds as “sparkler”. Mostly together with cabochons are usually used with a silver setting together with some gold, silver or platinum it can look quite pretty. Only the design is often not very stylish, solid pieces are also beautiful. Folklore and their religious beliefs in sort of Carved Buddha Statues are included. Even simple carving of a dragon, a horse or even a chicken evokes some meaning of good omen. Birds and fishes made from the material had some meaning. Here is a composition of carved horses for home decor made from nephrite (Chinese Jade) they are a real masterpiece of beautiful carving. Definitely an exceptional piece of interior decoration which needs a long time to learn how to do that read more. Here is a green jade chicken sculpture it shows that animals are used for interior decoration also the nephrite is not very intense it has a good transparency which is highly sought after. Also decorative tabletop and decorative items saw a shift away from nephrite which actually is the common “Chinese Jade”. The reason is twofold; one is a larger availability of imperial jadeite jade now which is a better quality mineral and wealth spread is more like distributed throughout China. Means buyers having more money and interested in high-end items such made from jadeite and abandoned nephrite which has less attractive properties including colors and texture. That directs buyers interest to the most valuable color which is emerald, grass or imperial green plus white and lavender. Chinese are the volume buyer and the country is the largest market for jadeite jade jewelry. In recent years the tendency shifts away from the old fashioned material which is nephrite and now the use jadeite for high-end items which has a better quality in terms of colors, texture, and transparency. Today mined worldwide but substantial jadeite sources, which is the high-quality version are only in Myanmar (Burma). Hang it around the neck fascinating jewelry becomes visible. Some of the most prominent jade jewelry are necklaces most come in green color and have a pendant attached. Buy there are also other hues from orange to yellow and the whole range of white and black. What do they all have in common? Yes, they are fascinating pieces of nature to make women shine, also men sometimes wear them in black. Beaded gemstone chain are some of the most common made from jade stone most are not so expensive but look good anyway. Sizes could be a long one or just a choker maybe with some diamonds in between. If you like to do it on your own the balls and strings are also available to give you some ideas to play jade is a very creative gemstone for jewelry. The pretty things around the neck should always help, this is believed since a few thousand years actually, nobody knows when this version of somehow superstition really came up first. Times are changing a bit, today the idea with a beautiful necklace and pendant is more just to let a woman shine. Also gold and silver plus at the higher end some precious stones such as rubies, sapphires (also called corundum) emeralds, and diamonds. Jadeite necklaces and rings are the most sold items because they are in a prominent position and have beautiful colors. Just have a look at these pretty necklaces made from jadeite and other from great blue Lapis Lazuli or golden transparent amber sometimes even including fossil inclusions which can be several million years old. It naturally has always something to do with style. Means is the color and size in fashion, are this novelty or another parameter. As with almost anything on earth the rarer stones are the higher the price and the more the demand. Naturally, people want to wear unique necklaces and maybe jade and jadeite is a good match since because the material is tough, won't break easy and is quickly cleaned. From the aesthetic point of view, it’s also easy to go along with other jewelry. Today multi-color jewelry is in high demand, this is supported by 3 factors, first the rings have the protective idea inherent to jade, second they are not as expensive and third they look good. Although when styled with cabochons they appear a bit conservative but they fulfill the purpose. Most have settings made from white gold and silver. Born in March? This is the birthstones and having Virgo as their Sun Sign, people say a jade ring will attract a positive aura and success. The great looking gems are usually cut and polished as cabochons to be the centerpiece of beautiful rings that are worn both by men and women. The interesting modern design is available with different styling but most people opt for cabochons in colors as you can see pictured below but they usually buy green and white. They can easily get quite expensive when the stones have a high level of transparency as it is usual with jadeite jade. This little thing on the finger look fine and are genuine jade jadeite that is what the people want. Actually, they are sought after by men and women and after bangles the most popular jewelry made from the green stone. The styling is mostly conservative but since the country has opened up now fresh ideas are trickling in and they make already some really good design. It is also a matter of age because most rings here are for an older audience since the younger crowd usually don't have the money to buy this pretty thing. Jade is and was an auspicious item in Chinese culture, no matter if it was 5000 years ago, under the communists and the red emperor or the ones on Taiwan who are not as mad as the communists but all have the same in mind success and good fortune to the wearer. Today the overwhelming tendency is to buy items made from Jadeite Jade this is actually the green stone from Myanmar or Burma the former Chinese Jade which is nephrite lost popularity because of quality and color issues. Traditionally these rings are worn to protect against evil and secure good health. The value is determined by color, texture, translucency and clarity but unfortunately there are many crooks around manipulating this parameter by bleaching through acid “baths” and fixing cracks with resin which, unfortunately, only last a while after about 3 years the material start to deteriorate and the pretty piece of jade jewelry is nothing but junk. Most popular colors are the usual green, in countless variants, white, lavender and mixed variants of these hues. Costs vary e.g. in Yangon’s Bogyoke Market green solid band rings are available for $ 5.00 and at another shop a few meters further away high-end rings are sold for $ 20.000.00 this shows the spectrum of the mineral value. Certain jadeite colors such as white, green, lavender and black are the most sought after. Although there are some more such as red and yellow they are not as much popular and it is rather common that the here indicated shades are mixed with other. That is one of the reasons why the value of a piece of jade also depends much on the question is it one color throughout or are there much mixed which mostly never looks very good. Big laughing Jade Buddha are great decorative items in every home or office, of course also in a temple. This is the best selling statues carved from jadeite stone. The preferred color is white and the range is from around 10 cm to less than a meter. If bigger is required it needs at custom made, the price range is from around $ 200,- to 40 thousand and more. The bigger the laughing Buddha statue get the higher the price but that is not the only parameter here again important factors are transparency, color, a smooth texture (no bumps when you run the over the surface). But with such jade sculptures be extremely careful they are mostly made from treated marble. If you ever want to buy one of them invest some dollars in a UV flashlight because with marble it won't be shining through for a narrow distance but jadeite it would which means there are methods to analyse Burmese Jadeite. Among them are green white and lavender jade from Myanmar (Burma). The country is also famous for golden pagodas, red rubies, blue sapphires and other precious stones. For a long time, most of the came from China as "Chinese Jade" which is actually nephrite but the mines got exhausted. Now people buy white jadeite from Myanmar and nephrite from Canada, China, among other, makes the final products such as jewelry, statues, ornaments and other objects. Although Chinese were the first to mine the stones on the larger scale from about 6.000 BC., they were not the only one since there are archaeological traces even as far as Switzerland and other places because of the strength of the material. To make it clear there haven’t been much genuine “Chinese Jade” anyway because it always came from Turkestan then and Myanmar (Burma) and Canada now. The picture right side shows a workshop in Mandalay where they create white marble Buddha Statues. Around the Mahamuni Temple are countless small shops creating arts and crafts? Mandalay is a gemstone center in upper Myanmar where most local jadeite jade is handled the other is exported to China, legal and illegal. As with other minerals the source where is comes from plays a crucial role here, we talk about jadeite jade from Myanmar (Burma), which is the top quality, and nephrite which is commonly known as “Chinese Jade”. It is found as “River Jade” and from the mine. What are the highest prized colors? The top is “Green”, there is also “Lavender Jade” mainly from Myanmar. Since it is difficult to find a uniformly flat one color the cleaner and more translucent a piece is the higher the price is. Until today white jade is often used to create Buddha Statues and Hindu deities.In terms of hardness, the material is not far off from diamonds and rubies which mean it is very difficult to handle and actually only became more easy about 200 years ago when the necessary technical equipment was invented. Chinese people were able to work with natural jade stones already about 6000 years ago as evidence from tombs shows. One of the bigger problems today is to get cheated because Chinese find continuously new way to manipulate the stone and find fake material they had long enough time to figure it out. They do in in a very coveted way so it is difficult for a non-expert to find that out. The methods are the usual one, bleaching in chemical solutions, heat-treatment, and surface repair. What is Black Jade used for? It has a macho image and it is difficult to find a real uniform totally dark rock, most have impurities of other colors mainly very dark green. The black mineral is commonly found in Aceh Province Indonesia and was a long-hidden source in Myanmar. Actually, until a few years ago this supply was practically not existing but the economic opening up of Burma made it visible. Most jewelry made from are bracelets for women and pendants and rings for men when the material is real clean it looks like black diamonds and also has quite similar properties in handling because it is almost as hard. Magnificent carved pendants are made of Chinese warriors, dragons, and mythical birds. The black type has the masculine image and best are pendants, women prefer bracelets and bangles. Above is some raw black jade mined in Kachin State in Myanmar (Burma) and on sale in the Bogyoke Aung San Market in Yangon, a real fascinating gemstone indeed. A different color of the stone of heaven which became a more mystical stone why is that so? When the gemstone was built inside the earth a high amount of graphite and iron oxide penetrated the material which makes it black, today the hue symbolizes strength and protection. This version of jade is found all over the world but the best-saturated black is found in Myanmar’s Kachin State. Actually, people interpret all kind of additional properties into it. Where the hues come from? The emerald alike green jade color comes from chromium diffusion during the formation process and is the high-end variant. Value can easily match other precious stones such as rubies, sapphires, and even diamonds. which makes green jade during the creation process. At current times the sought after material is natural jadeite from Myanmar (Burma), this is a very fine material and there is nothing better that's the reason why this business is booming and the northern neighbors (China) are on the buy side. It's a fine material in particular with the right texture varying from the glass like called translucency to fat greases like structure, shape and transparent opaque used for jewelry and sculptures such as Buddha. Top prices always paid for green jade with transparency and a uniform color, because that's the right color with some tensions since they directly correlate to money when selling. There is emerald, olivine and plenty of other mostly all this is jadeite, a lesser quality is nephrite. There is talk about to relate this to culture in the Chinese world since the stone has a high value and within money driven Chinese culture it stands automatically for it somehow but this gemstone of top quality almost always are Burmese jadeite. Most buyers want green imperial jade for a top price it should have a rich semi-transparent appearance, the more the higher the value, just have a look at this bangles and rings. It can be worked into beautiful pieces of jewelry such as earrings, pendants, necklaces, bracelets and artistic statues and other objects. To make the jewels even more attractive carvings are made, they use a driller for that. Sometimes some white gold or silver is worked around the actual stone to allow the return of the light back into the mineral which increases reflection and makes it more shiny and transparent. In Myanmar produced jewelry is usually pure no metals around. These artworks are very decorative and a sure positive eye catcher in any home or office.A difficult part of the creation is to bring the right hue in a proper position since this is one stone it needs some thinking to handle this. Finally what is jadeite jade? Buyers have certain preferences, at the third position is that beautiful shade and is also reflected in the price range. Usually, it’s white jade with lavender veins. Since most fine material comes from Myanmar / Burma beautiful objects are for sales such as statues, bangles, pendants and other can be seen on a larger scale at the Bogyoke Market in Yangon, the premier shopping for minerals. China is “the Navel of the Jadeworld” and dealers there have defined about 120 hue's of the “Stone of Heaven” and only they really know them since some even bring "a morning shade" into it and other an "afternoon glow" plus more. At the bazaar in Yangon, many creative natural jade works are on display, in the past designs were very conservative which is changing rapidly into trendy jewelry designs.Today natural items are demanded, the main buyer is Chinese women over 40 who have some money to spend, younger ladies usually buy lower priced items. But demand is growing rapidly over the whole spectrum which brings in crooks who try to make quick money with fake and manipulated items. The manipulated items are almost exclusively made by Chinese who put below average quality pieces into acid and get resins under high pressure into the stone to fill cracks . They look good when sold but after around 3 years they are just rubbish. This makes it important to understand at least a bit how to identify quality, the first rule is to take a magnifying lens and torch light with this basic tools plenty of fake items already can be identified if it’s natural authentic or not. Highly polished lavender jade with intense colors and a good value of translucency is highly priced. This type of jade stone is also often used for bigger items such as a Jade Buddha Sculpture since the prices are still in a manageable region which can’t be done with imperial jade or other top green since the prices will be simply too high. That's one of the reasons why Buddha statues from over about 40 cm height are mostly done in white and lavender. The best place to have a look for jewelry, statues, sculptures is here. This oriental bazaar in Yangon is an amazing jade trading place, have a look at the pictures to give you a good idea what is available. It is easy to find the right shade to match skin tones plus clothing you wear, another idea could be to go with the season, means winter cooler tones summer warmer. Have a quick look at your wardrobe, it’s easy to figure out which color you prefer and since jade colors are over the whole spectrum the right match is not far away. Unfortunately, most people only want green since this is the most popular but there are beautiful other colors. Certain impurities penetrated the stones millions of years ago when the earth was still formed under immense heat and pressure, chromium traces make the best green. Since it is not very easy to find these colors in all qualities go online and search around. If it once coincidently happens that you are on a tour in Asia or live there do a stopover in Myanmar, Yangon is the center of gravity in the world for it including rubies, lapiz-lazuli, sapphires, amber and other precious stones, great deals could be made in Yangon. The result is, almost every color is available, blue is mainly found in today Guatemala and Honduras, all other top quality stones always come from upper Burma or northern Myanmar. Actually, it is mined worldwide, but most found is the lower grade form which is nephrite. In Burma jadeite is mined that’s the “good stuff” of the jade stone. This mineral is always related to China and when their deposits got exhausted they were searching for other supply, northern Burma started to deliver, these deposits were known to them since hundreds of years because in a short period in history this was Chinese territory. In general, when buying asks the seller to go with you outside the shop into the normal light since the ones in the shops don't show the real color, this is also very relevant in any high-end jewelry shop, they have special lighting which let the items look much better than in normal daylight. E.g. there are a couple of great shops in Singapore and Kuala Lumpur with this sophisticated lighting.